One of my favorite beer-store games is what I'll call Belgian Beer Roulette*. I'm sure you're already familiar with the concept of Russian Roulette, but a quick google search yields a Belgian variant where instead of placing a single bullet in a revolver, you place rounds in all but one chamber, spin the cylinder, point the gun at your head and pull the trigger. Fortunately, Belgian Beer Roulette is not nearly as insane or deadly to play. To play, you need 5-10$ and a bottle shop with lots of Belgian beers you've never heard of. Purchase one of said unfamiliar Belgian beers, chill, and drink. I'm quite the fan of Belgian beers, so I daresay that my odds of "winning" are probably more like Russian Roulette (5 out of 6 win) than Belgian Roulette (1 out of 6 win). Generally I look for something with a tasteful label (I'm a total sucker for a coat of arms). This is, of course, not always the most reliable indicator, but that's how I stumbled on to some of my favorite Belgian breweries, like Westmalle and Affligem. So one day, I see a series of beers from Maredsous. Nice clean label design and the store had a blonde, a dubbel, and a tripel (i.e. styles I love), so I picked up the Dubbel. As I write this, I now find out that the Maredsous brand is actually brewed at the Duvel Moortgat brewery. Maredsous is a Benedictine abbey, apparently famous for their cheese, but in 1963, they also began to license their name to Moortgat. I don't know how much the monks contribute to the actual brewing of the beer or the recipes or whatnot (sometimes monks direct brewing efforts outside their abbey, but I can't tell what's going on in this case), but I'm willing to bet that they drink a shitload of the stuff. * I'm not the originator of this term as a way to describe this process - I have Jay from the Hedonist Beer Jive (now just Hedonist Jive) to thank for that. It's a fantastic term though, and it fits how I sometimes shop. Thanks Jay! I've played Belgian Beer Roulette many a time, and only lost twice that I can recall. Once, it was a bottle of Kriek that I think had gone bad, and the other was a sampler pack of beers from Grimbergen, which were all nasty, way overmalted, and hugely disappointing. 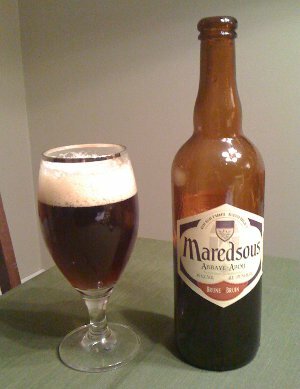 I know I've had a few beers from Maredsous, but it was long enough ago that I can't reliably say what they were. I can't think of a time when I'd say I "lost" Beglian Beer Roulette, but there were certainly times I was a little disappointed. Or when I got something and had no idea what I was getting (I had a gueuze like that once). This page contains a single entry by Mark published on March 15, 2011 6:29 PM. Style and Stone Sublimely Self-Righteous Ale was the previous entry in this blog. Beer Blogging and a Double Tripel Feature is the next entry in this blog.